NBA All-Star Andrew Bynum is looking to sell his custom 2009 Ferrari Supercharged Coupe and has turned to eBay Motors to do so. Aside from its celebrity association, what makes this Ferrari so special? 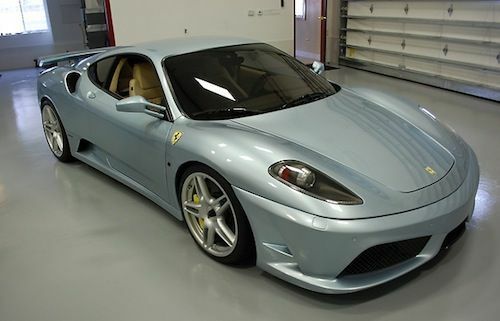 Well, Andrew Bynum’s former ride, a Ferrari F430, features nearly every upgrade imaginable from Novitec. In fact, the supercar boasts more than $200,000 in upgrades alone. Prior to examining the Ferrari F430’s many aftermarket extras, it’s worth noting the vehicles impressive factory features. The Italian sports car touts factory-installed options like Scuderia Shields, Power Daytona Seats, Alcantara Leather Interior, Carbon Fiber Driving Zone, Carbon Fiber Engine Compartment, Colored Stiching, Colored Stearing Wheel, Electric Operated Seats. In terms of upgrades, Bynum’s Ferrari features a slew of exciting and pricey Novitec-exclusive options like NF3 Wheels, Twin Super Chargers, Exhaust System, ECU, Modified Gearbox, Carbon Fiber Airbox, Carbon Fiber Engine Vents, Carbon Fiber Air Filter Housings, Rear Bumper, Rear Decklid Spoiler, KW Adjustable Suspension System, Supersport Carbon Fiber and Leather Wrapped Steering Wheel, Carbon Fiber Long Shift Paddled, Tinted Tail Lights, Yellow Valve Covers, and a customer sound system. Collectively, the Novitec upgrades are worth about $200,000. The original MSRP of the vehicle before upgrades was $229,436. As for what’s under the hood, this Ferrari F430 is equipped with a 4.3-liter 4308CC V8 2-DOHC 40V Naturally Aspirated engine, which pounds out 785 HP. It also boasts an F1 transmission. Despite once being worth over $400,000, the luxury sports car can be yours for nearly half price. There are currently 10 days left to purchase the vehicle at its Buy It Now price of $209,000. As per seller’s request, a deposit of $200 must be paid within 24 hours of auction close. Full payment is required within 7 days of auction close. Although Bynum’s collection is now one vehicle lighter, the NBA star still boasts an impressive garage that includes a custom Ford F-150, Lakers-themed Dodge Challenger SRT8, Bumblebee-themed Chevy Camaro, Nissan GTR, Ferrari 599 GTB Fiorano, Porsche TECHART GT Street R and a 820 HP BMW M6. Selected 10th overall by the Los Angeles Lakers in 2005, Bynum is a two-time NBA Champion and current center for the Philadelphia 76ers. Bynum posted his best season as a pro last year averaging 18.7 points, 11.8 rebounds and 1.93 blocks with the Lakers. Despite his All-Star season, Bynum was traded to the 76ers after the 2011-2012 season as part of a four-team deal that sent Dwight Howard to the Lakers. Want to see what $200,000 in vehicle upgrades looks like?